After the bug arrives, I'm fully expecting a dining-out lockdown for awhile. We'll be tired, anxious, and way more comfortable staying at home and noshing on take-out or leftovers than juggling a new baby and a menu. I know others will say that it's the best time to go out, but for me personally? Not so much. We're not major restaurant rovers anyway, so it's not a huge sacrifice, however, I have been musing over a list of "last ditch dines" for us. Some are brand new and potential favorites-to-be, others are old friends. Realistically, I don't know how many we'll get to but it's always good to have goals, especially ones as tasty as these, so here you go, 12 Bay Area restaurants we want to hit before our late-June due date. 1. Contigo: Friend and fellow food blogger Brett Emerson opened his anxiously-anticipated Spanish/Catalan restaurant a few months ago. Unfortunately, while the press and other friends have already been lucky enough to partake and swoon over his pork belly bocadillo and homemade potato chips, I haven't made it to the table. 2. Ubuntu: I was already jonesing to try out the Napa restaurant that celebrates the purest flavors of vegetables, but after meeting pastry chef Deanie at a mutual friends' wedding, I was even more excited to make reservations. Among everything else on their menu, the cast-iron cauliflower and anything they think to do with artichokes beckons. 3. Duarte's Tavern: Speaking of artichokes, I've heard that Duarte's is the aritchoke lover's idea of heaven. I've already sampled their ollalieberry pie (purchased from The Milk Pail and warmed up at home) and was seduced by a berry I had never tasted before in my life, so things can only go up with a visit to Pescadero and a calamari steak sandwich. Plus, this artichoke lover has to get to heaven somehow. Bonus: "Pescadero" never fails to make me think of Pinky Tuscadero and Happy Days. 4. Lavanda (old favorite): Well, technically we've only been here once for lunch and it was a few years ago, but we were really impressed by the menu. It's pricey, so it would normally be on our "special occasion" list, but I'm keeping it on this pre-baby list. Since we last visited, they've made a bigger deal about their organic and local provisions, and I'm looking forward to trying: grilled skirt steak with Salinas asparagus and spring garlic butter, stuffed risotto fritters, and potato gnocchi with black chanterelles, Hen of the Wood mushrooms, and nepitella. 5. Bar Jules (old favorite): Hands-down, Bar Jules is my favorite lunch spot in San Francisco. The atmosphere is so sunny and chill, it's the perfect place to meet girlfriends for a good, nourishing gabfest. However, their dinners are nothing to sneeze at, either. I especially love their flank steak and la quercia prosciutto with long cooked favas on toast and pecorino sardo. 6. 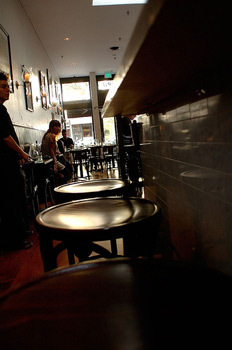 Delfina (old favorite): Since my mother-in-law will be in town, we already have reservations for Mother's Day here, so I am thisclose to my stomach checking off Delfina's homemade pasta and grilled calamari with impossibly tiny warm beans. 7. SPQR (old favorite): Last time I was here, I was still in the nauseous stage of my pregnancy and couldn't enjoy my fried Brussels sprouts, cacio e pepe, and fried chicken to the fullest. That's a travesty that MUST be corrected! Also, a new travesty that must be avoided: not tasting their griddled Heritage pork spareribs with rosemary and fennel. I do think "griddled" is one of the most sumptuous words in the English language. 8. Flea Street Cafe: Sadly, Jesse Ziff Cool's other Menlo Park establishment -- JZ Cool Eatery -- recently closed in order to open a new place in East Menlo Park, but luckily Cool Cafe at the Stanford Museum and Flea Street Cafe are both still open. I've done Cool Cafe quite a few times and love their sandwiches, but I'm hankering to do a local, seasonal sit-down dinner at Flea Street very soon. 9. Martin's West Pub: It's a new upscale pub from Michael Dotson and it's coming to Redwood City in May. With items on the menu like Scotch Eggs, peat-smoked fries, and nettle-crowdie ravioli with brown butter consommé, morels, and spring onions, things are definitely looking up in suburbia. Oh, and the fact that they also have my favorite pub grub ever in the form of Ploughman's lunch means they were put on this earth for the sole purpose of feeding me. 10. Humphrey Slocombe: I've been scarfing down my pregnancy pounds in the form of all sorts of ice cream -- Haagen-Dazs Five, Foster's Freeze dipped cones, Blizzards -- so I think it's only fair I give this new place a whirl. If not just to roll my tongue over their oft-Tweeted bourbon-cornflake flavor, then to give major pocket props to fellow Are You Being Served? fans. 11. Piccino (old favorite): My husband has been an angel to scoot up to Piccino from the Peninsula whenever I've had a craving for their pizza, and when we met Mr. and Mrs. Piccino at a friend's dinner party, we made no secret of what fanatics we are for their pizzas. They told me I definitely had come up and eat with them when I was close to delivery. Apparently, their constantly changing pizzas have been known to send women into labor. 12. Pasta Moon (old favorite): Every time we go, I swear I'm going to try something new, and every time we go I don't try something new. I simply cannot resist their butternut squash and mascarpone ravioli with brown butter sage and Amaretti. However, because my husband is more enterprising, I know that their pizzas are awesome, their seasonal fritto misto is outstanding (especially when they include thin slices of Meyer lemons), and their Wild Mushroom Ragú with polenta, Marsala, and Parmigiano-Reggiano is totally bathable.